I just uploaded my GPS marathon data to Nike+ and got this congrats from Paula Radcliffe. 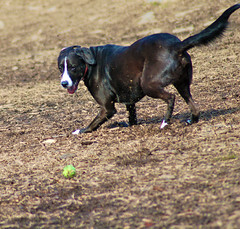 Ozma chases a ball at Piedmont Park. Reposting this here in her memory. Ozma passed away last night a little after 10 pm. 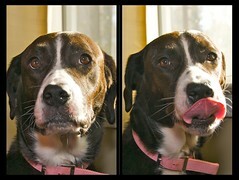 She has been the most amazing dog and will be greatly missed. I’m reposting this capture in her memory. I planned to run on Saturday, but the unfortunate combination of cold temperatures and periods of heavy rain forced me to push the run to Sunday. Moving a long run day throws a lot of things off. I don’t just have to plan for the duration of the run but for recovery time as well. I also adjust my eating patters before a long run to make sure I’m well hydrated and have been consuming plenty of carbohydrates. I don’t know if due the delay or I was just having an off day, but this particular run was one of the most physically difficult things I’ve ever done in my life. I waited until the day had warmed the air from this sub-freezing temperatures. I was dressed in layers, but the temps didn’t feel too bad as I got into the run. There were still some icy patches on top of some of the bridges. I ran strong for the first half, but tried to hold back. I didn’t really even look at my gps watch until I approached the half way point. In retrospect, I should have been consulting it more frequently. It looks like I went out too fast. Just after the 11 mile mark my heart started pounding and my energy waned such that I started walking some. At the 13 mile (half marathon distance) mark I started walking more than I ran. My muscles were cramping and I was in some significant pain. Walking actually made this worse but trying to run at certain times was so hard that I had to stay with it. Also with the change in muscle effort came a change in my body temp. Layers that I had slowly decided to peel off before had to return. Just past the 15 mile mark I dropped an energy gel packet and stopped to pick up. Bending down to get it was agony. Somewhere passed this point I stopped adding running intervals entirely. The expenditure of energy needed to make a change in pace felt-wasteful when the point of this run clearly switched from training to getting it done. I finished this “run” in 4 hours and 7 minutes (roughly an average of 12 mins/mile.) Afterward it was probably another 15 minutes of cool down walking, stretching, and trying to get some nutrients before I actually had the strength and energy to drive home. They say you should respect the distance of anything over a half marathon and this certainly proves it to me. I’ll be even more careful to watch my eating and to rest properly prior to the marathon. My nose runs faster than I do when I exercise in the cold. I’ve been carrying Kleenex, but these have been getting shredded. I think I’ll switch to carrying a couple of handkerchiefs. The running pants I was wearing have a zipper on the side so you can remove them, if need be, during the run without taking off your shoes. That zipper irritates my left ankle and sometimes sinks down and gets wedged between my shoe and ankle. I need to find some different running pants or figure out how to secure that zipper for the marathon. Watch that speed and keep it low early in the race. I can’t rely on my body to tell me how much effort I’m expending early on in a run. I feel good and it lies to me. If I’m feeling good after the half way mark then I can always pick up the pace then. But it’s very very difficult to recover from going out too fast to start with. I now start the three week taper in preparation for the big event. My next long run is just 10 miles, then 8 miles, then 6. With my longest run of training being just 21 miles, there’s still 5.2 miles (7 km) of all new distance to cover on marathon day. With any luck, this hard run will just be a blip when I think back over all the training that has gone into this marathon. I’m as nervous about the race as ever. But I’m going to start that race healthy and as well trained as I can be. Whatever happens after that, happens. I just got a new vinyl decal from Mac Appeal on Etsy. 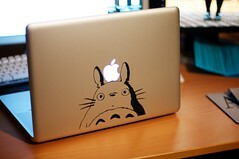 Totoro on my MacBook Pro! Yesterday I set for myself a new distance record. This time it’s nearly three miles longer than my previous record. While I’m quite proud of that I’m also a bit concerned. This run felt much harder than the last long run. The weather was quite cold, even starting at noon I pretty sure the weather on the trail never got out of the 30s and the wind was relentless. Whenever I’d slow down to conserve energy I’d feel my extremities complaining about the cold. I think, because of the temp, I also didn’t drink quite enough. Though I didn’t feel thirsty and I was cold, I was still sweating and that’s likely to have caused an imbalance which made the end of the run harder. It turns out that Saturday would have been a much more comfortable day for a run, but some emergency issues at the office had me working overtime this weekend. I hadn’t signed into my Nike+ account in a while, but I had been syncing my runs. Apparently this past Saturday, without realizing it, I set a new PR for my 10K time. Cool. 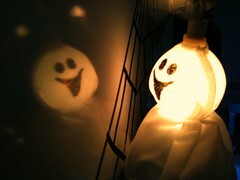 A ghost admires his reflection in the whiteboard as the office prepares for Halloween festivities. My wife, Marie spots the finish line and pours on the speed at the end of her first 5k race. The race was at Piedmont Park during the Atlanta AIDS Walk/Run. I was so proud! I’ve been riding one heck of a high since the start of the race on Saturday night, so I guess it’s time to get down my recap and impressions before I come completely back to Earth. In May I decided to go for a new goal. About half a year before I surprised myself by committing to a goal and after a lot of time and sweat, discovering that not only am I able to run but that I really enjoyed it. But by May I had reached a plateau. I did a fair amount of research and read a few books. I decided if I could surprise myself once by being able to run a 5k, I could use the same skills to work all the way up to a Marathon. Clearly, I’m not quite there yet, but I just crossed a big milestone on the way by running and finishing my first half marathon race. Initially, I hadn’t planned to run this race. I didn’t really think I’d be up to running the half this early in the training. But as I kept working up the miles it became clear that I could. The problem being, Disney’s Wine and Dine Half Marathon was already sold out when I realized it. I ended up getting my shot in August when I saw a post on the DisneyRunning.com forum that Disney had opened a waiting list for the event. I didn’t think I’d have much of a shot, but I decided to put my name on the list anyway. A week later I was quite pleased to see that they had opened up more spots and I’d get to run it after all. — W00t! Now that I was signed up, all that was let to do was keep training. That worked out pretty well until about three weeks before race. I was doing a weekend long run of 10 miles, which was down from 14 miles the weekend prior. The run felt much harder than I’d like and I was really glad to be done. Then a couple hours later I noticed a stinging pain to the left of of my left knee. Unlike the muscle soreness that usually goes with my long runs, the pain didn’t go away with a couple days of rest. In fact, I wasn’t able to run again for two weeks. It wasn’t until the weekend prior to the race that I was able to run without any pain or problem. That was a huge relief. A few runs later I realized I would be able to go on with the half marathon. I was still concerned that my knee might not hold up and I definitely knew I wasn’t going to be able to run it as hard as I’d been planning. I hadn’t planned to worry about my time anyway, but I had been hoping that this race might qualify me for a better corral in January’s marathon. Ah well. My nerves started building on Wednesday before the race. I checked my packing list multiple times and we flew down from Atlanta to Orlando in the evening on Thursday. All of my important running gear was, of course, in my carry on. Thank goodness I was able to get one of the last bags into the overhead bin before they were full. My wife and I flew down together from Atlanta while my father flew in from Dallas Texas. It was a risk scheduling out flights so close together an meeting up at the airport, but despite a short delay in Atlanta we actually pulled it off without any of us having to wait too long for the other. We made the mistake of meeting up on the opposite side of the airport from the Disney Express shuttle that would take us from the airport to the hotel, but this early in the trip a little extra walking wasn’t going to hurt us. The last time my wife and I used the Magical Express service was March of this year when we visited and stayed in the Animal Kingdom Lodge to celebrate our first anniversary. Back then the bus first stopped at all three All Star resorts before dropping us off at the Animal Kingdom Lodge resort last. For this trip, though, we were less inclined to spend so much for our accommodations and were booked at the All Star Movies resort. So of course, this time the bus stopped at the Animal Kingdom Lodge first. I had done the online checkin the day before, so getting into the room was a fairly smooth process. We had a “premium” room at the All Star Movies resort. It was on the third floor of the 101 Dalmations wing of the resort. As best I can tell, the only thing that qualified this as a “premium” room was possibly it’s proximity to front desk area and pools. Otherwise, it was wholly unexceptional for an All Star room. I know the All Star resorts are in the process of refurbishing the rooms with better furniture and flat screen televisions. They clearly hadn’t made it to this section of the All Star Movies resort yet. The carpet and walls showed quite a bit of wear and the TV in the room looked to be a 17″ tube type. However, for our group, none of this was that big a deal. I don’t think we even turned on the TV once during this trip. We were all pretty hungry when we arrived, so we stashed our carry on luggage in the room and headed to the hotel’s food court. It was 10 at night on a Thursday and the place still seemed to be hopping. Partly this seemed to be because 2 of the 4 main serving areas were closed for the night. This was our first taste of something my wife and I knew was going to be a challenge for us on this trip. In trips to Disney past, a visit there was typically considered to be an excuse to throw caution to the wind when it came to making healthy eating selection. However, we both recently started working with a sports nutritionist and were determined not to let a vacation ruin the positive lifestyle changes we’d been making. In addition my wife has also switched to eating only vegan fare and she wanted to not eating any meat on this trip. The food court did have some more healthful options available, but they were harder to find than I’d like and much more expensive that I had expected. We found $4 fruit cups, $2 low fat strawberry yogurt, and I added a bagel with peanut butter because I was moderately carb loading at that point. The peanut butter cost 50 cents! We enjoyed our meal and headed back to the room to crash. About 11:30 pm our checked back arrived at the room bringing with it our stash of Cliff Bars and Mix 1 protein shakes that we knew would be essential for saving some money and giving us something healthful to eat while wandering around the parks. It was also just in time for my to get the stuff I needed to take out my contacts and get ready for bed. Get up a few hours before the park opens and get ready. Head back out to the parks in the evening feeling refreshed by the rest. For this trip, with a night time race coming up, early morning park touring seemed like a bad idea. So for the first time ever at Walt Disney World I didn’t set the alarm clock once during the entire trip. Friday did not start bright and early. Still, being the typical morning person, I awoke around 7:30 or so and had trouble getting back to sleep. I decided to read in bed for a while until my wife and father decided to get up. I’m really proud of my wife. She has recently been working up to running a 5K herself. In fact she’s signed up to run in her first race next weekend. With the run coming up so soon, she decided not to slack of on her running while we were on vacation and started nearly every day with a run around the resort. Planning to run the half marathon on legs as fresh as I could make them, I did not join her. Once we finally got it all back together we made our way to Disney’s Hollywood Studios, arriving there around 11 am. By this point, I knew a ride on Toy Story Midway Mania was likely out of the question. The standby queue was already over an hour and the fast pass return time was approaching closing time. So we headed over to Tower of Terror and Rockin Roller Coaster. Strangely each of these super-headliner attractions only had 10 minute queues. Before leaving this area we rode Tower of Terror twice and went once around on the Rockin Roller Coaster. After hitting the thrill rides we took in The Great Movie Ride. We sat right behind the driver which can either be a treat or an annoyance. The combination of speakers and hearing him project in front of us meant he a little too loud for is. He also had a speech impediment that meant he needed to work that much harder. He generally seemed to stick to the script of previous trips through this attraction so overall I’d give his performance a meh. The bandit that took over the trams for a bit was from the Western movies area and ways a really animated cowgirl. Most of the counter service places around Disney’s Hollywood Studios are pretty lame. We ended up eating at the area outside the Tower of Terror where I got a less than average ceaser salad with a slice of cheese pizza and Marie found an alright veggie burger. By this point we were getting well into the afternoon and even though we didn’t get an early start, a break was on everyone’s mind. We headed back to All Star Movies for a little light napping. After relaxing for a bit, Marie decided to hang back in room and work on her math homework. Did I mention that I’m quite proud of my wife? My dad and I headed over to the Half Marathon expo. My confession is that I’m a huge Walt Disney World fan but not really much of a sports fan at all, so this was my first time ever visiting the ESPN Wide World of Sport. I have to say that this facility was much nicer that I would have thought. It seems like they have the capability to host just about any kind of sport that can be played there and do it in style. On the bus on the way there we got an earful of a passenger that I sure hope was drunk. I hate to think that anyone might be that loud, boisterous, and annoying sober. The driver had some important announcements about how early to head out to the race start the next day and what to expect. All of it being loudly talked over by Mr. Obnoxious. My dad and I played it cool, but we quite pleased to be getting off the bus and away from him. Overall, I’d have to say that the packet pickup for the race was quite efficient. I brought my waiver for the even with me, but they had computers and printers available for folks that had forgotten theirs. From there it’s onto a set of kiosks with volunteers organized by race number. I got into a line that was about 5 folks deep. And, of course, Mr. Obnoxious was in the line as well. Fortunately he seemed to have toned down a bit and the line moved quickly. In the packet we picked up, besides lots of flyers for other races and crap I didn’t need, was the sheet of “final race instructions”, my bib (#5649), D tag for race time tracking, some safety pins, a wrist band I was supposed to wear at the party (which I did but I’m not really sure why), and vouchers for the free taste and sip at the party. I kind of think giving food vouchers to the runners before the actual party was kind of stupid. That meant there was lots of opportunity to lose them prior. And then the runner either had to check the vouchers before the race or find some place to stash them for the run. Fortunately, I could just ask my family to carry them. Contrast this to the folks that were just coming to the party. All they needed was the party ticket and they were handed their vouchers when they came into the party. Why couldn’t they have done the same thing with the runners who were leaving the finish line? Anyway, after picking up the packet, we headed over to the D-Tag testing area to make sure my tag worked and the computer knew who I was. That worked beautifully, so then it was off to pick up my t-shirt and technically I was done. From there my dad and I went over to another booth where they were selling the “ChEar Squad” packages and picked up one for him and Marie. Disney really has figured out how to make money at every possible opportunity. Because this is a night along highways and in parks, there was no where for general spectators to watch the race without buying one of these packages. At least they got a nice t-shirt, some noise makers, and and a little carry bag out of the deal. All wrapped up, my dad and I headed back to the hotel and picked up Marie who had finished with her homework for the day. We ditched out stuff in the room and headed on to Epcot. We arrived there around 7:30 pm and then I made my biggest mistake as a Disney World guide yet. I subscribe to touringplans.com. I usually find their crowd calendar quite helpful, but it’s their lines application on the iPhone that I love the most. I don’t have to go hunting for the park’s tips board to find out what the current wait time and pass pass times are for most attractions. Using it I saw that the queue for Soarin was about 35 minutes and that it’s fast passes were gone for the day. But, fast passes were still available for Test Track. So I grabbed everyone’s park passes and got some fast passes for test track. Then I directed us to the queue for Soarin. Outside the Soarin queue, the system said the wait time was 65 minutes. I know that cast members like frequently like to bump up the queue times as it gets closer to closing time to discourage new folks from getting in line and that way they get to go home on time. So I ignored it. And we waited, and waited, and waited. Easily 80 minutes later, we finally made our way off Soarin. It was after 9 pm and illuminations had already started. So we found ourselves a spot to watch the end outside Canada. Once it was all over, we didn’t head back to the buses. Instead we made our way through the International Gateway exit of Epcot and wandered over to the Boardwalk. This turned out to be a great move because we found a little pastry and sandwich shop there that had something yummy for all of us. We at a leisurely diner. Now normally getting from resort to resort is one huge pain in the rump using Disney transportation. The typical advice it to take the bus to Downtown Disney and then transfer there to another bus heading to your resort. In my experience this always takes much longer than it should. Fortunately for us, Mickey’s Not So Scary Halloween Park was going on in the Magic Kingdom this night. So busses were still running. We hopped the bus to the Magic Kingdom from the Boardwalk and then transferred there to the All Star Movies but with minimal waiting compared to what I’m used to at Downtown Disney. We got back to our resort around 11 or so and sleep came pretty easily to all of us. 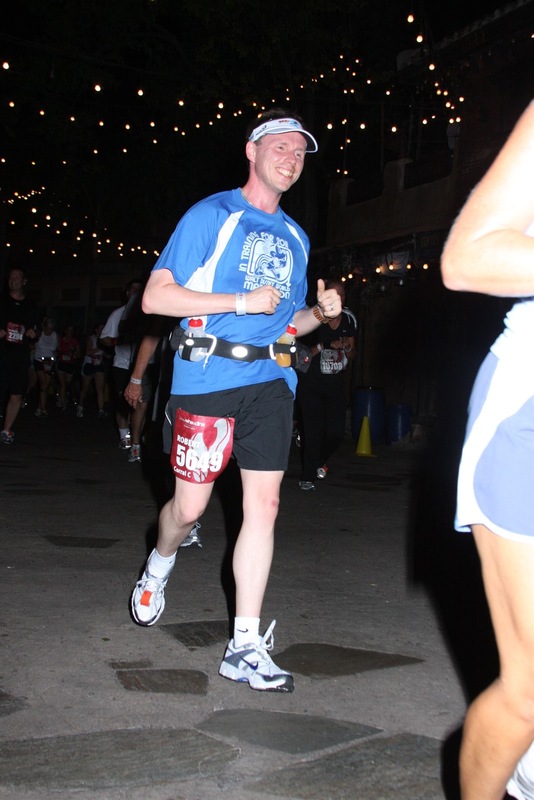 I had a dream that night that I ran in the half marathon and it felt really easy. It definitely took some time. At some point I also had to run on boats and cars. I remember talked to people after the dream race and explaining I would have had a better time but you had to stop in several places along the way to solve brain teasers and other puzzle. Guess I was a bit nervous about the real race coming up. On race day I awoke about 8 am. Again it started with reading in bed until everyone else roused and started getting ready for the day. Marie got her run in, we grabbed a little breakfast, and then we were off to Disney’s Animal Kingdom park. We got to the park at a decent hour and made our way straight to Everest in Asia. Being coaster fans, we grabbed a fast pass and then got into the standby queue which was only about 15 minutes. That is such a great, fun coaster in the grand Disney mountains style. I think it also has one of the most interestingly themed queues in Disney World. After getting chased by a Yeti for a while we made are way over to be chased by a dinosaur. Once again, there was basically no line into the Dino Institute. We went back in time for a bit, got chased by a carnataurus, and almost wiped out by an asteroid, but in the end found ourselves comfortably back in Dinoland U.S.A. inside a gift shop. The line for Primeval whirl was prohibitively long, so we skipped it. We made our way back to Asia to take on the Yeti one more time and then enjoyed the Flights of Wonder show. I’ve seen this show a few times, the plot and message never really chance, but the actors do and it can be quite fun to see what nuances different people will bring to the roles. We felt old for a moment when my wife noticed that most folks in the audience didn’t seem to know why a crane being named Fraiser should be so fun. After Flights of Wonder we wandered over to Africa and saw Devine along the way. I love this streetmousphere character. She’s so graceful and elegant. I’m always entertained by the fact that many park guest tend to truck on right by her until the see someone else notice her and wonder what the other guests are looking at. In Africa we picked up some fast passes for the Kilimanjaro Safaris and decided to hunt around for some lunch. We asked at the podium and luckily found out that The Tusker House had some lunch seating available. I’ve never eaten here before and have heard mixed review. I had also heard that it’s a buffet with some of the best vegetarian options at Disney World, so I knew it would go over well with Marie. This turned out to be a, mostly, great pick. Marie and my dad found lots of great things to eat. That said, I realized the timing was little off for me. With a race coming up that night, I knew it wouldn’t be smart for me to each much of anything that might tax my digestive system. I ended up having simple foods like rotisserie chicken and fruit. I did sneak in just a little curry rice. Another nice happenstance with getting to eat at The Tusker House is that they were offering a package with reserved seating at the Finding Nemo The Musical Show that day. So after lunch, we headed right over there and got great seats for the show. The performance was absolutely wonderful and as well done as any broadway style play I’ve seen. My best friend would be glad to know that the mako shark, Chum, from that story featured as a prominent character in a couple of scenes. After the show we had to do some swimming of our own. We moved uphill through the crowds watching the Jammin Jungle Parade. It turns out that during the parade, there’s a certain place along the route that you can’t pass on the way to Africa. Our luck was still running strong though, because as we reached it, the last float of the parade was traveling by. It turns out, because they block off the path, they also close the Kilimanjaro Safaris during the parade. It was about 4:30 when we reached it and the park closes at 5 pm. When they reopened they were only letting folks in through the fast pass queue, so there was not need for the pass by then. The last few safaris of the day are always the most interesting. They air is cooling and the animals are becoming more active. After a great day at Animal Kingdom it was time to get some rest before the race. I had thought I might take a nap, but I was too nervous/excited to really get any sleep. Instead I got all pieces of my running outfit together and filled my fuel belt with water and powerade. At 6:45 pm I just couldn’t sit around and wait anymore. It was time to head over to the start of the race. Technically the last bus left at 8:00 pm, but we had been warned numerous times that if there were more people waiting than could get on the bus, the others would not be taken to the start and would not get to run. So we left early just in case. At the All Star Movies resort there were about 7 motor coaches lined up to take runners to the start. I have to wonder why Disney feels the need to use these rented motor coaches instead of the huge fleet of busses they already have. But I can’t really complain because the motor coaches are much more comfortable. The driver put The Fox and The Hound 2 on the bus TV to keep us entertained as we waited to leave the hotel and during the trip over. It was waiting on this bus that I first discovered how super-friendly other runners can been. I struck up a conversation with a pair of runners who had clearly been doing this for a while. They were using this race as a warmup for the Marine Corps Marathon at the end of this month. They’re also planning to come back in February to do the Goofy Challenge. At the ESPN Wide World of Sports we entered a huge grass field where we would be waiting the next few hours till it was time to open the corrals. The only place I’ve ever seen more port-a-potties was in Washington D.C. It was a lot of waiting, but they did a lot to make the time fun. There was a super-hyper DJ trying to get the crowd worked up and involving folks in different dancing and fitness games. I stayed away from this, because just before my first 13.1 mile race didn’t seem like the right time to be wearing myself out with pushups and crunches. There were also a few characters floating about for photo ops. I was also quite entertained by the other runners that were planning to run in costume. Tinkerbells and Minnie Mice were the most popular but I also saw The Mad Hatter, The Incredibles, a bunch of grapes, and even a character from The Hangover. There was also one couple who had just been married and were running in outfits that looked like a tux and wedding dress. We waited, enjoyed the people embarrassing themselves with the DJ, and I sipped on sports drink and ate a cliff bar. Finally at 9 pm they opened the corrals. I said goodbye to my wife and dad who headed over to the information area to be escorted to the viewing area at the start of the race. I took one more trip to the the port-a-potties which by this point actually had a bunch of lines and then into corral C. It seems my timing was actually pretty good because I was only 6 or people back from the start of the corral. It started filling in deep behind me in short order. There were four corrals for this race. Given that I didn’t have a previous race time to present on registration I was surprised to find that I wasn’t placed in the last one. I can only guess that there must be a whole lot of walkers in corral D.
Went I got into the corral I was enjoying that they speakers there so you could hear the DJ and keep the energy up. Strangely, though, it seemed the speakers near us cut out for a while as the race time got closer. On the plus side, this gave me a bit of time to chat with some of the other runners around me. We were all pretty excited. About 1/2 hour before race time I ate a banana and lacking a trashcan anywhere, I tossed the peel over the side of the corral. This appears to be common practice at races but took me a while to get comfortable with it. About fifteen minute prior to the race they removed the barriers between the corrals and we all smooshed up together. At this point we could hear the pre-race chatter again on the speakers as they kicked in with the National Anthem. There’s nothing like being nervous for your first race to make you feel especially patriotic. At two minutes before race time they started the wheelchair athletes. I was glad to see the crowed was really supportive of these folks. We couldn’t see them start but we sure could hear the cheers. And finally it was 10 pm and the moment of truth. The countdown started, the fireworks went off, and the cheering became deafening. From where I was it still took us nearly 5 minutes to get up to the starting line. I enjoyed catching a gimps of my supports at the starting line and giving them a wave. Running passed the starting line I started my Garmin and could smell the powder from the fireworks that went off earlier. A quietness started to settle in. It was still pretty night, I was just barely jogging at this point and just trying not to bump into the other runners around me. Rounding the corner and onto the main highway for the run, the quietness lifted as we approached the the first band along the route. I had no idea how motivating the entertainment along the course would be. The performers energy transferred more easily that it ever had through my iPod when running before. Making it past the first mile marker, the crowds started finally started to thin out bit. Knowing I’m relatively slow I tended to hang to the right side of the course. Even so, I still found myself passing a lot of folks. I had a short moment of panic for a moment when I saw someone weaving in the crowd in front of me with a bicycle. I relaxed quite a bit when Garmin showed me I was making good time and the guy on the bike was just a race official trying to make sure everyone was OK. I was also surprised how many injuries there were early in the race. I saw a couple of folks laying on the side with race officials around before the second mile marker. I guess it goes to show that night running is dangerous. The weather for this race was great. I guess it was in the mid to low 70s though there was still a fair amount of humidity. Still, I’d been training in Atlanta in the Summer time to to me the conditions felt ideal. Hills, heat, and humidity are sure rough to train through, but on nights like this was I think it paid off. I was really excited when I saw the Animal Kingdom park come up. I was finally going to get to run through my first theme park. I wasn’t sure what to expect since the park is usually only open during daylight hours. I wondered what, if anything might be lit up. Along the way around the huge parking lot that leads to the Animal Kingdom was a fish float from Disney’s Mainstreet Electrical Parade. It was spinning around and as I ran by it started swimming right next to me. It was a little faster than I was, which made for a nice bit of motivation. After that it was a water stop and then into the Animal Kingdom running right past the front gates. I wondered if there might be a choice for which part of the Oasis we should run through and how that might factor into the race distance. They handled it but just directing us all down the left side of it. I remember running over the bridge towards the Tree of Life. I don’t think it seemed to be illuminated in any special way. Into Discovery Island, we hung a left again and ran into Africa making the run around the outside loop of the park. From Africa we ran into Asia which was quite pretty at night. I don’t think Everest was lit up like it usually is but we could hear the Yeti growling and howling as we ran by. Next we ran by Finding Nemo the Musical and on into Chester and Hester’s Dinorama. That’s where our on stage experience ended. The course was directed to an exit neat the Dinosaur attraction and into back stage. I remember seeing a few trailers and utility buildings. This was where the course diverged for folks running the entire half marathon and those running the relay. It seemed that had folks yelling announcements from about 400 yards before the split. The half marathoners were told to keep to the left and the relay runners moved to the right. Here we could also hear the DJ keeping the party going in the relay transition area and announcing to folks that their run was finished and now it was time to relax and party. It seemed a little mean to those of us continuing on for the half. After all we were just 8k into the race with another 13k left ahead of us. Making our way out of the Animal Kingdom I got a sense of just how much attention to detail the race coordinators had put into this event. About 200 yards from the toll plaza for the Animal Kingdom we could hear a prerecorded announcement, “Attention runners. There is a speed bump in the toll plaza ahead.” It continued to make this announcement every few seconds with some variation on that phrase. Then, when reaching the toll plaza they had cast member volunteers on either side of the speed bump between each toll booth, pointing it out runners as they went by. Back out onto the highway, it was time to run back the direction we came. Given my pace, I was a little surprised to still see runners coming down the other side of the road. Though the crowds were considerably thinner than what I ran through. Along this stretch we ran by Goofy, back by the same band from the beginning of the race and more entertainers wearing stilts. These folks were giving VERY high fives. Clapping hands with them, I started to feel very very energized. More than half way through and I was actually having trouble keeping my pace down to a reasonable level. There’s one place along this stretch that is an out and back only divided by cones. I can see where the temptation may have been very strong for some runners to cut the course short and head straight for the ramp that would take them to Disney’s MGM studios. At the turn around for the out and back there was a D-Tag reader. So I rather imagine Disney knows who did and didn’t cut the course. Fortunately, still feeling great, there was no way I was going to do that. The folks that did cut would also have missed one heck of a salsa band performing on the sidelines.I couldn’t help but clap along with them as I ran by. Now it was time to take on the hilliest part of the course. The ramp down onto World Drive and then back up to Disney’s Hollywood Studios. Here they had stationed the sergeant from the Green Army Men to motivate folks down and up the hill. This was motivating but also kind of funny to me. I’ve been training in Atlanta and we have a different idea about what constitutes a hill here. I imagine those from more mountainous regions found the announcements to be even more amusing. I’d say that this segment along World Drive was also one of the most treacherous for the course. They had done a really good job of bringing out supplemental light in places that weren’t well illuminated already. Here though, they kind of dropped the ball. At the end of this, they were distributing shot bloks with packages and slime all over the ground which made things even more dangerous. 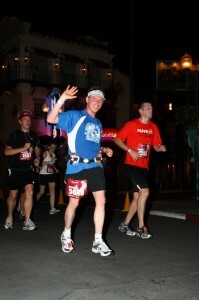 Keeping my footing up the hill it was time to run into the Disney Hollywood Studios and oh boy what a long run it was! We started out running in from back stage behind the Tower of Terror and then on stage into the area in front of the Rockin Roller Coaster. We then rounded back around the front of the tower of terror and down past it’s queue entrance into one of the areas used to access the Fantasmic theater. From there it was back out next to the theater used for the Beauty and the Beast show, down the street and then around past Pixar Place. I believe the course turned right past Toy Story attraction and we were running down the path of the back stage tour. Running through the tunnel past the set designer and costume shop was a lot of fun. I can only think that it might have been even more if it were a weekday race and there were folks inside working. Then we turned around and ran behind where they appear to keep the trams for the Backstage tour. I was holding out a little hope that we might run through Catastrophe Canyon, but it’s probably best that we didn’t. Instead we made our way though the stadium for Lights, Motors, Action. This was particularly cool because they had the jumbotron TV screen on showing us running by. Of course I had to ham it up for the camera a bit as I went past. It turns out the jumbotron wouldn’t be the biggest treat on this twisting and winding journey through Disney’s Hollywood Studios. As we exited the stadium the next sight was quite breathtaking as we ran down the Streets of America. I hadn’t noticed them when we were there a day earlier, but the Osborn lights were already up there and they were on in all of their sparkling glory. All the runners around me were oohing and aahing right along with me. Next we past Tattoine Traders and Star Tours. We could hear the Imperial March while running by and Darth Vader was out nodding and bowing to the passing runners. Instead of cutting left here and heading for Gramin’s Chinese Theater I was a quite surprised that we turned right for a brief trip back stage behind the Indiana Jones Epic Stunt Spectacular. I would like to have been able to linger a bit through this area because I know it’s where the do the staging for parades. But there was no time as we were getting into the last miles of the race and the finish line beckoned. We popped back on stage behind the front gates, ran around the service station, then into the main plaza just outside of the park. Somewhere around here was the 12 mile sign. I had been holding back a bit for the entire race. Here I checked in with myself: A little muscle soreness, feet in good shape, heart rate in check, and plenty of fuel left in the tank. I gave myself permission to pull the governor and tackle the last mile as full power. I’ve always wanted to jog the path between Disney Hollywood Studios and Epcot and now I was given the chance to really run it. It was along this stretch that the supporters, not just Disney cast members, but guests here to support the runners were out in full force. They lined the path first showing up every 40 yards or so. Eventually they built into a solid wall of cow bells and cheering. They were especially loud as we got to the boardwalk area outside of the Beach and Yacht Club Resorts. Off the boards and headed now to the International Gateway the finish line was in sight. There cheering was loud. I threw my arms up and yelled right along with them! I felt amazing. I was so energized I knew I could keep going and going. I had just hit the biggest milestone yet on my way to the marathon in January. What a high! I knew my wife and father were in that cheering crowd somewhere. I missed seeing them. 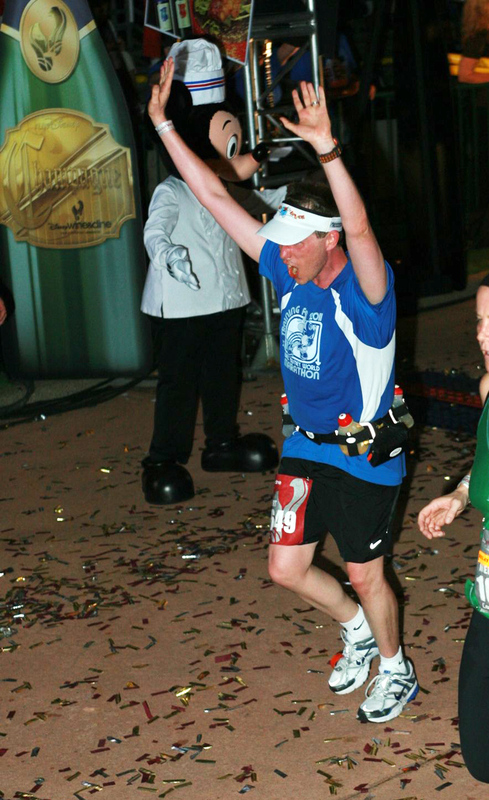 Photographic evidence also shows that Mickey Mouse was at the finish line. I was so overwhelmed I totally missed seeing him too. The next stop was the after race photo. Here they had six or so stations setup with photographers and a backdrop. Again the line was only 6 or so folks deep and it probably took a minute and a half to get the photo done. Now I was really starting to feel the cramps. I knew my best strategy was to keep moving. The final stop was through the building they use for the Party for the Senses for bag check. All I can say is thank goodness I didn’t check a bag. There was a line to go into the building at the far right just for people that didn’t check anything. It still took about 5 minutes to get in the building, sign the paper saying I had everything, and leave. The slow movement was taking it’s toll on my cramping muscles and I found myself trying to will people to keep moving so I could relieve the pain. The exit to the party building opened to the UK area of Epcot. The best way I could describe this area was ELBOW TO ELBOW people. If I was a drinking person, though, I would have been quite pleased to see the server with trays of wine and beer there for the offering. I knew there was no way I was going to be able to meet up with my supporters there. We texted each other and agreed to meet in Germany. My hope was that the crowds would be a lot thinner half way around the World Show case and it would give me a chance to talk off the building cramps. The UK and France were jam packed, but thankfully coming into Morroco the crowding became more manageable and I was actually able to catch my dad and my wife. It’s at this point that I started to realize that I haven’t had anything to eat since finish the race. Fortunately, I carried a fuel belt with me for the race and hadn’t eat all of my cliff shots nor drank all of my orange powerade. So I polished that off as we headed out to look for tastier fare. We continued to wander the reminder of the world showcase. We took in the Maelstrom in Norway. And that’s when my traveling companions started to let me know they were worn out. They had been on that finish line cheering for two hours and it had taken its toll. I’m really glad they spoke up, because I was still quite pumped and not the least bit sleepy. Realizing Mexico was our last chance to use the food vouchers, I got in line there. It was only around a 15 minute wait to put in my order for a corn dish and frozen fruit punch. I consumed these quickly and we made our way to the exit which was all the way at the front of the park. They again had the motor coaches running shuttle service from Epcot back to the resorts. I thought we might be in for a wait as we arrived to find a line of people that couldn’t fit on to a bus that just left. But in less than 5 minutes another bus pulled into it’s spot and we were on the way back to the All Star Movies resort. Back at the room, my traveling companions were quick into bed. It was after 3 am now. I thought it might be a good idea to get a quick shower before doing the same. Into the show and then into bed, I had trouble getting to sleep. The memories of the race were still fresh. I didn’t sleep very much. And then come 7:30 the next morning, I woke up and couldn’t get back to sleep. As you might expect, Sunday was a slow starting day. For me, the Delayed Onset Muscle Soreness has started to set in and my travel partners were still sleeping off all the cheering they had done the night before. For most of the morning I sat in bed reading and waiting for signs of life. 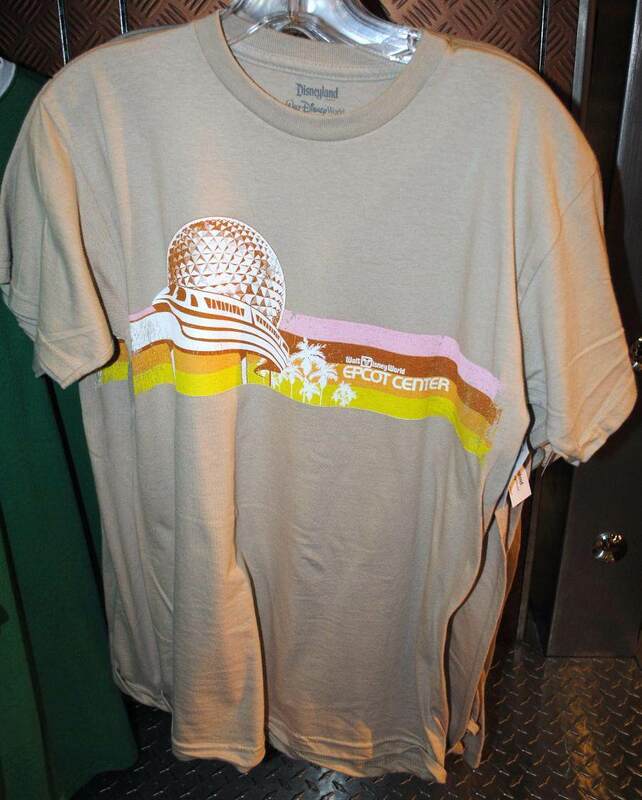 This seemed like a good day to go back to Epcot. Having just earned a new medal and t-shirt, there was no way I was going to let them languish in the room. Nope, today I was going to wear them proudly. At first I felt a little self-conscious wearing the medal out of the hotel room. 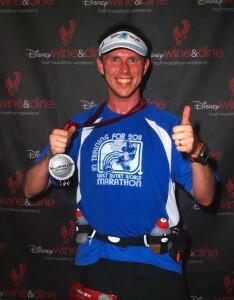 Getting on the bus to Epcot though, we immediately meet other runners with their metals. There were congratulations all around. Despite getting to the Park close to lunch time, hours after the park had been open sailing was easy through Future World. We got a decent fast pass time for Soarin right off the bat and hit Living with the Land; a walk-on. Living with the Land was never my favorite attraction, but I’ve always enjoyed it. I think it’s lost a lot though since they took the cast members out of the boats and replaced them with a recording. It’s clearly on message for it’s Nestle corporate big agriculture inspired roots, but it misses the nueances of what experiments are going on there right now and the ability for the cast member to respond to the reaction of the crowd. Getting and in an out of the Living with the Land boat with post-race muscles added a bit to the adventure. Given that we still had some time before the fast passes came ready, we decided to head over to the Imagination pavilion. This would require making out way back up to the top level of The Land pavilion. Of course, it would be the day after the race that the escalator going up would be out of order. Boy those stairs were fun! I feel like a lot of this trip reminded me about things I miss in Epcot. Journey into Imagination falls in that category. I really miss the original attraction with Dreamfinder. At least they brought back Figment after his brief hiatus from that attraction. There were large blocks of the ImageWorks at the exit to the attraction that were blocked off. I don’t know what they’re planning for it. It might be blocked off because they are still removing the Kodak sponsor signs and software or it could be down until they can find another sponsor. Speaking of change and nostalgia, the next stop was Micheal Jackson as Captain EO. I’d heard rumors of it’s return for years and I really thought it’d never happen. Once the official announcement was made, I almost didn’t believe it then. In the age of 3D movies in every theater, even 4D movies are becoming a pretty weak attraction. All that said, what a fun dose of nostalgia it is. Next up was Soarin’ which was great as always. This time we ended up in seats that were in the middle of the theater which made the experience even better than the last ride when we were on the far end. After Soarin’ we had lunch as Sunshine Seasons in the Land. This is probably my favorite counter service restaurant in all of Disney World. I love all the options and being able to make healthy choices. My vegetarian wife especially loves it. Now with full stomachs it was time to tackle the other side of Future World. This, of course, also started with a pair of fast passes. This time for Test Track. Once again we were easily able to get a decent return time. To burn up that time we when one attraction to the left. Here again it’s time for some nostalgia. I’m a big fan of Mission Space, I think it’s one of the most entertaining attractions of the last few years. But every time I head over to this area, I’m reminded of the Horizons attraction that used to occupy the same spot. An attraction that helped to foster my love of science and engineering. I loved it’s optimistic view of technologically mediated future. My wife loves thrill rides. I mean REALLY loves them. On our honeymoon in Tokyo we must have ridden the Tower of Terror at Tokyo DisneySeas at least a dozen times. However, after some uncomfortable experiences in the past with the Orange team on Mission Space, it’s be Green team for us ever since. We only had three in our flight crew, but everyone did their jobs well and we landed successfully on Mars. This may come as a shock, but Mission Space exits through a gift shop. It was there that I eyeballed some awesome t-shirts with the old 1980’s Disney World and EPCOT Center logos. On this nostalgic trip, I knew I’d be coming home with one. Ellen’s Energy Adventure entertains and it’s a great way to get to sit for a while in air conditioned comfort. It’s a cute, overly symplistic story, who’s bent on energy production doesn’t stand up well to current social moires and certainly tap dances well to appease it’s orginal sponsor, Exxon Mobile. We returned to Test Track to use our fast passes. The experience is enjoyable, but sometimes feels a bit too much like rush hour here in Atlanta. Still, this is one attraction I think was an excellent replacement for World of Motion that used to occupy this spot. It’s also the only attraction that lets you see backstage at Epcot so long as your eyes are open and you’re not hyper-focused on the read ahead of you. Next up was the attraction that tells us a little bit about our “grand and miraculous spaceship that has sailed the universe of time.” Spaceship Earth is another attraction for which I’m torn between whether it’s recent updates were positive or negative. Frankly Walter Cronkite and Jeremy Irons were far more rousing narrators to me that Judi Dench. Some of the replaced descriptions of the scenes I actually find to be galling. Rome’s roads were not the “first world wide web” and the libraries of Jewish and Islamic scholars were not the first “backup system.” Heck, they don’t even say “Islamic” in the description of the scene anymore. I guess “Middle-Eastern” is less offensive to the general American population. On the plus side I do enjoy the new interactive ending to the attraction and the new scenes of the data center and what appears to be Woz working in his garage or well done. I’m guessing the attraction sensed my frustration over some of the changes, since it stopped with us just past the Earth planetarium for at least 10 minutes. Finally to round out our Future World adventures it was time for The Seas with Nemo and Friends. In case you’re wondering, I think the overlay of Nemo on the original Living Seas attraction was a really smart move. Though I miss some of the more serious, scientific content the attraction was becoming quite dated. These changes have brought new life to the area. With Future World in out pockets it was time to take on the countries in the daylight. At least, that was the plan. We made it all the way to Morocco before we realized we were completely worn out. We took the Friendship back to Future World, I stopped by Mission Space and bought my Epcot Center t-shirt, and then made our way back to the resort for naps and general relaxation. The plan for heading back to the resort was to rest and then head into downtown Disney later that evening to meet up with some friends that lived in the area. But naps turned into a quick diner and then back to the room for the night. Thoroughly worn out but happy about the fun day we had. On Monday morning the muscle soreness was worse than the day before. Once again though, I had a reason to keep moving. Besides being our last day at Disney World, it was Magic Kingdom day. This was a another late starting morining, though this time it wasn’t because we all slept in, but because we needed to get everything packed up. So pack up we did. Then we checked a bag back to Atlanta and took a bus to the Magic Kingdom. I was still wearing my race metal. The prediction system on touringplans.com had predicted this would be a quiet, low-attendance day at the Magic Kingdom. Oh boy was it wrong. In retrospect it would turn out to be the busiest park of them all. Typically I’ve visited Disney World during the quieter times: Spring, late fall, or Dec before Christmas. I don’t think I’ve ever seen this park busier. Our visit was for about 4 hours. In that time we only managed to take on Space, Splash, and Big Thunder mountains. When it was time we were quite worn out and ready to head home. Before heading home though, we had taken a rain check and made plans to catch up with our friends that lived in Fl at Downtown Disney. The problem, it turned out, was that there was not bus leaving directly from the Magic Kingdom to Downtown Disney. What should have been a 20 – 30 minute trip turned into an hour and a half trip on a boat to the Wilderness Lodge and then a bus to Downtown Disney. Whew! We eventually arrived with just enough time to have lunch with our friends as Earl of Sandwich. I’ve never really given this eatery a shot before but I really quite liked it. Their prices were reasonable, they had relatively healthful fare, and the it was quite yummy. When I’m in Downtown Disney again, I’ll be eating there. Our friends gave all of a ride back to the hotel to wait for our bus back to the airport. This worked out great. My father and I said our goodbyes. He headed back to Texas and we got through security and to the gate just in time for our zone to board. Then we sat on the plane, and said sat, and sat some more. About 30 minutes late we pushed away from the gate and headed to the runway. The captain came on and explained we were next in line for take off. Then we sat, and waited. After another half hour off sitting and watching other planes take off the captain came back on the address system explaining that they had a warning light while we were taxiing and needed to get instructions on what to do next. Eventually we headed back to the gate where I had a great view of the maintenance crew inspecting and working on the flaps of the left wing. During this time, we got to know our seat neighbor. Turns out she had just run her first 5k run at Disney World that was the morning of the half marathon and her boyfriend had run in the half. We had a great chat. Eventually they got it all fixed and about two hours after the scheduled take off we were in the air and on the way home from and incredible trip. I can’t wait to do it all again in January for the full marathon!